There are lots of places on the web that'll tell you about established DC or Marvel canon. The purpose of this guide, however, is to give you an overview of the combined universe, as it's represented in the game. Nevertheless, welcome to Earth-626. 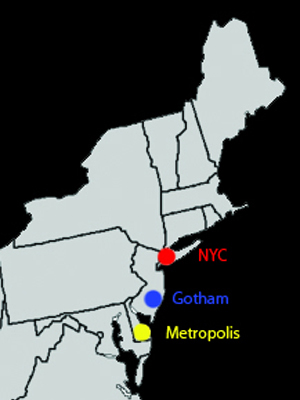 We have chosen to use three cities iconic within comic books. Gotham City, New York, and Metropolis. This is not because of the characters attached to them, but for the feel of the cities. For those looking for RP where heroes are beloved and celebrated, Metropolis is your town. For those that want dark and gritty, Gotham's your go-to place. New York is sort of our middle ground, where the city in general has no defined bias but generally are not as happy about them as Metro, not as suspicious as Gotham. In addition, the three cities serve as a good breakdown for the "level" of RP you're looking for. Street-level characters fit in great in Gotham. Our larger-than-life do well in Metropolis and New York City is the wildcard to middle ground. That doesn't mean that you can't have a street-level character in Metro though! These are just the generalities (and strongly suggested for thematic balance - please consider the impact your character could have on canon based locations). Finally, though they are three cities, we don't want to lock your RP into any one place, where if you live in New York you have no reason to spend the several hours to get to Metropolis. The 'Tri-City Corridor' as it's known, is connected via high-speed maglev train so that Gotham north to New York or South to Metropolis is cheap, 30 minute train ride. Is it realistic? Not terribly, no. But this is comic books. Crazy stuff happens. Also, this is a game for RP, and we want to remove obstacles to that RP. Not create more by having isolated islands. Add maps and images where possible.